Many believe that the term Catalunya derives from the term “land of castles”, having evolved from the term castlà or castlan – the medieval term for a castellan (ruler of a castle). The city of Barcelona of course, has many castles; with the home of FCB the Camp Nou being one of its most famous fortifictions. The kings of the Camp Nou meanwhile have been numerous with one of the most famous being Johann Cryuff. The mercurial Dutchman ruled as both a player and manager at the club eventually leading the Catalan giants to its first ever European Cup triumph in 1992. On the 2nd of November 2009 it was announced that Dutch legend and former Barcelona manager Johan Cruyff would be the new coach of Catalonia. His first game was a friendly against Los Albicelestes, the Argentinian team, which ended in the Catalonian side winning 4–2 at Camp Nou. One year later another friendly challenge match was played this time against Honduras, with the hosts winning 4–0 at the Estadi Olímpico. Another year on, again during a hectic La Liga season, Catalonia played Tunisia in a dire goalless draw meaning that this tie against Nigeria at the Cornellà-El Prat home of Espanyol would be Cryuff’s last game in charge. The recent history of Catalonia is a tale of great success but in the early part of the 20th century things had not been so prosperous. 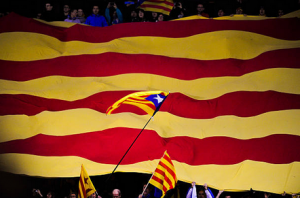 After the Spanish Civil War, Franco imposed several restrictions on Catalonia, abolishing the Generalitat de Catalunya and banning the official use of the Catalan language and the symbolic Catalan flag. Despite these restrictions, the Catalan national football team continued to play regularly during this period and even played the Spanish team twice with some guest players. On 19 October 1947, at the one time Sarrià home of Espanyol they beat Spain 3–1. Six years later on 9 August 1953, Spain avenged this defeat with a 6–0 win. Known as Selecció de futbol de Catalunya the team is the official football side of the Spanish autonomous community of Catalonia. Its matches are organised by the unaffiliated Catalan Football Federation, unofficial in that the team are not affiliated with either FIFA or UEFA. The team therefore are not allowed to participate in either the FIFA World Cup or the UEFA European Championship and instead the players play for the Spanish national team. Indeed several players for the Catalan team were integral to the Spanish win at the 2010 SA World Cup event. Johan Cryuff’s final game in charge of the Catalonian football team featured a host of Barcelona stars stars like Gerard Pique, Xavi and Bojan. The dominance of FCB was very evident in a team greatly influenced by the affluent riches seemingly available on rotation from the La Masia academy – a chamber of footballing excellence that has long furnished the Catalonian national side. The squad called up to face Nigeria had no fewer than 10 Barcelona players in its ranks. Victor Valdes, deputy to Iker Casillas for Spain, was included whilst the defence could feature Carles Puyol, Gerard Piqué, and Jordi Alba. The 2010 World Cup winning left-back Joan Capdevila is also an integral member of the squad, whilst Xavi and Sergio Busquets provide effortless control in the blue colours of the Catalan XI. A multitude of other options up top include former La Masia prodigy Bojan Krkic, Jonathan Soriano, and Barcelona youngster Cristian Tello. Nigeria meanwhile were using the game primarily as a gateway to the ensuing African Cup of Nations later in the year with the Super Eagles hoping to be crowed African Champions again. As is often the case with friendly matches so close to an international centrepiece, the Nigerian manager or Big Boss Stephen Keshi was charged with the dual tasks of further assessing both domestic and overseas players and finalising his squad plans. Moreover a key aspect of the game was in developing and establishing a style of play as well as a relationship and understanding between his potential first XI. The match was a typical friendly affair played in calm surroundings. Pre match Catalan themed celebrations gave way to flag waving before the host side took the lead through a penalty. Soon after half time the visitors Bright Dike equalised for the away side giving some pleasure to the watching Nigerian fans. In contrast to the hysterical passion of the Basque national team followers – whose fixtures are often strewn with pyrotechics and nationalistic chants – there was true family feel at the Espanyol stadium with children making up more than half of those watching on.